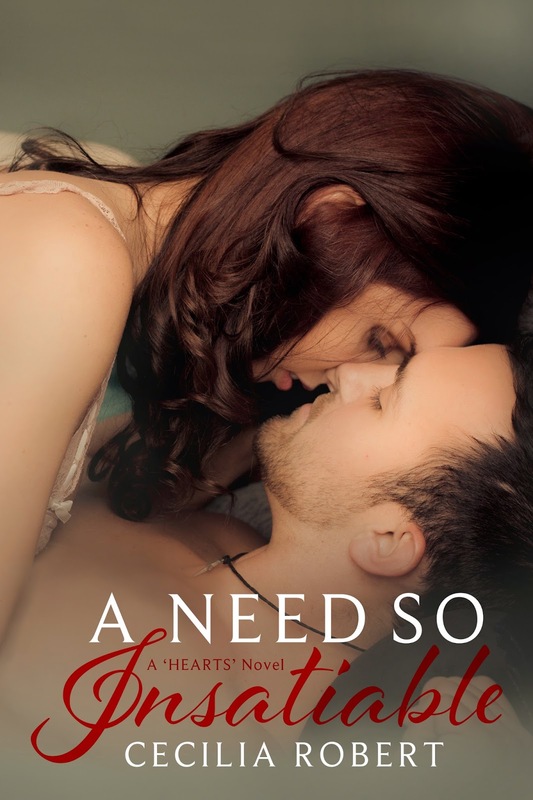 Introducing A Need So Insatiable by Cecilia Robert, a New Adult Romance on sale now for 99cents to celebrate its release this week! The stapler I’m holding slips out of my free hand and clatters on the desk. “Good.” He moves around the counter to sit on Maria’s chair. It creaks under his weight and his scent slams into my throat. There’s no way I’ll get any work done with him sitting there. Every shift of his body heightens my awareness of him. He leans forward, his cheek touching my shoulder, and my heart thuds faster in my chest. “You have beautiful fingers,” he says, his breath a warm breeze on my skin. Aw, hell! Two can play that game. “You have beautiful lips,” I say. “I spent most of my nights this week wondering how they’d feel on my skin--” He shifts closer, the heat coming off him slams into me. The air surrounding him rearranges, bowing to this god of hotness. Back away. No, come closer, please. Dear God, deliver me from temptation! Gripping the mouse, I close the email program and power off the computer. “You done?” he asks. Did his voice get sexier? I turn to look at him. Is that amusement on his face? “For now.” I pull out the bottom drawer and grab my handbag. “I can’t work with you breathing down my neck.” I smile saucily at him, and stand. He quickly tugs my hand, and I collapse onto his lap. He leans in to lick my neck. “I wasn’t breathing down your neck. Believe me, breathing down your neck would feel very different.” His lips are so close. So very close. His gaze is fixed on my lips. If I move two inches, our mouths would touch. He inhales sharply, his pupils dark and dilated. I hop down his lap, brushing my fingers along the huge bulge in his pants, and wink at him. If he wants to play the flirting game, I’m all for it. I pick up Alejandro’s messages and walk toward his office, feeling Rafael’s hot gaze on me the whole way. Rafael isn’t where I left him when I return. I pause, taking a deep breath and look around. Rafael is so freakin’ intense. My nerves are still tingling from the contact with his tongue minutes ago. I rub my palms down my black pencil skirt, heading toward my desk. A hand grabs my wrist before I can make it there. Heat skates up my arm like a live wire. I’m yanked into a hard chest and backed up to a wall in two seconds flat. My pencil skirt rides up my thighs as he grabs my legs and tucks them around his hips, pushing his muscular thighs forward. My black heels dig into his back as his body pins me to the wall. He plants his strong hands on the wall next to my head, caging me in. I couldn’t escape if I wanted to. “Will you?” The words sound like a growl and his lips are an inch from mine. He smells like liquor, cologne and Rafael. “Will I what?” I’m trembling like I’m jacked up on electricity and the heat curling between my legs is unlike any I’ve ever experienced. He brushes his lips on my forehead, my jaw, tracing them along my upper lip, teasingly, breathing life into my skin. His tongue sneaks out to brush the labret on my lip, and he groans deeply. I can’t help but moan in response. His warm breath on my skin has me aching so damn bad. He finally kisses me, and I’m flying. Even gravity can’t hold us down. The world around us falls away and, for a moment, we’re in a place where time and problems cease to exist. Where it’s just Rafael and me. A Need So Insatiable by Cecilia Robert is a New Adult Romance, released March 8 2014 and available from Amazon. Our pleasure, Cecilia! Thanks for stopping by!